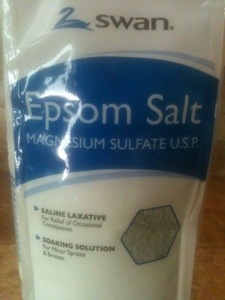 CVS, Walgreen’s or Walmart all have generic and name brand versions of Epsom Salts. Currently, I have been rotating between generic from Walgreen’s ($2.50) and Dr. Teals with Spearmint and Eucalyptus ($5.00). 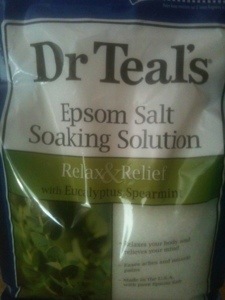 The Spearmint and Eucalyptus were supposed to be calming aromatics. To that end, I have a preference for the generic stuff versus Dr. Teal’s oily film. So lets get down to the process. 1. 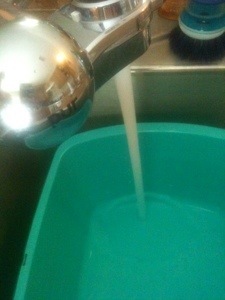 Fill your pan or bath with warm or hot water. 2. 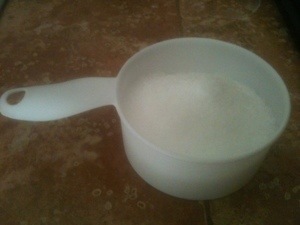 Measure out 2 cups of Epsom Salt per gallon of water. 4. Insert your body or feet for 30 minutes or more, look for pruning skin. The 30 minutes and pruning has been a good measurement for maximum effect. As always consult a medical profession before usage as there maybe unintended consequences with drug interactions and/or those with diabetes. 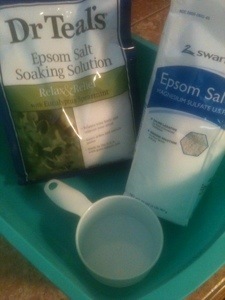 This entry was posted in Health, Science and tagged Dr. Teal's Epsom Salt, Epsom Salt, Healing Water, health, Magnesium. Bookmark the permalink.